The average plaintiff relies on his/her attorney to know and obey the court’s Local Rules and its Orders. The Scheduling Order is the big one. It’s the one that fixes the dates for every step in the litigation process leading up to the trial. It fixes all of the dates for the attorneys to disclose information about witnesses, evidence, and expert reports. In short, it is the case's time line. The courts have broad authority to enforce their rules, including the authority to prevent a witness, including an expert witness, from testifying at trial if the attorney has not timely disclosed the identify of the witness and, in the case of experts, the expert's report, fee schedule, exhibits, and cases in which the expert has testified, whether at trial or in deposition, during the preceding four years. This is a particularly troublesome problem when dealing with the client's "treating doctor." The rule for a "hired" expert is clear: the attorney must timely identify the expert and file the expert report and all of the documents mentioned above. While the non-hired expert like the treating doctor is exempt for these filings, the Rule become murky if the attorney wants the treating doctor to testify about matters like medical causation: "Doctor, in your opinion based upon reasonable medical certainly, did this automobile rear-end crash cause the Client's low back injury?" The attorney must know the Judge's attitude as some apply the "hired" expert rule to the treating doctor and, if the attorney disobeys the court's order, the court will not allow the doctor to discuss medical causation. Courts strictly enforce their orders. For example, a federal court recently ruled that it would not allow the plaintiff’s expert to testify at trial because the attorney had failed to timely file the expert’s report as required by the court’s Scheduling Order, rejecting the attorney’s lame excuse that he had “forgotten” to file it timely. So the plaintiff goes to trial without his expert witness. What should the attorney do? First, he should immediately tell his client what has happened. Second, he should immediately file the proper motion asking the court for relief, provided of course the attorney has a valid reason for disobeying a court order. What’s the point here? Since the case belongs to the client, we actively involve the clients in every aspect of their case. We send our clients copies of everything: pleadings, discovery, court orders, correspondence, depositions, our case evaluation, and medical records and our medical-record summary. Importantly, we send our clients copies of all office legal research memos on each narrow legal issue so that our clients understand both the factual and the applicable legal issues. Finally, we send our clients a Weekly Status Report outlining all activities that occurred in their cases that week. Our methods best prepare and educate our clients about their cases which gives them a realistic value of their case and helps them to know if a settlement offer is fair and reasonable. At the Law Offices of Richard R. Kennedy, we have the knowledge and experience to handle personal injury cases. We know and understand the importance of keeping our clients actively involved and informed about their cases. 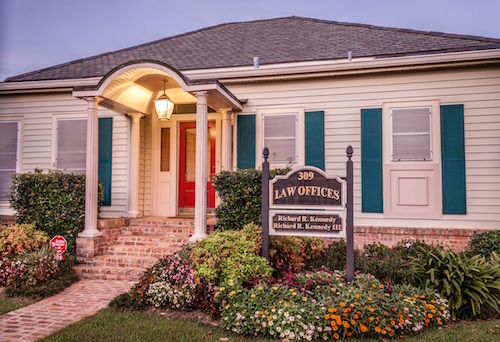 If you or your loved one have suffered harm because of the negligence of another, contact the attorneys at the Law Offices of Richard R. Kennedy to discuss your legal rights at (337) 232-1934 or (800) 440-1934 (toll-free). For more information please see Personal Injury, Motor Vehicle Accidents, Maritime Law.